Revelstoke Mountain Resort ski patrollers train on the lead-up to opening day. Revelstoke Mountain Resort posted its second most popular video ever last week. The video shows pro skiers Chris Rubens and Christina Lusti sampling the goods on Separate Reality last Tuesday, Nov. 22. Most of the 91,000+ viewers noticed the amazing powder as they shredded down into the bowl. My co-worker, with his keen eye, noted the crack in the snow when they got to the bottom of the bowl. As anyone who’d been out touring could tell you — the snow ws incredible up high, but marginal lower down. I spoke to Nielsen on Thursday and it snowed almost 50 centimetres at RMR over the weekend and more was in the forecast for this week. While I can’t vouch for the resort, I can say ski-outs were much friendlier after last week’s storms. That bodes well for opening day, this Saturday, Dec. 3. Last year the resort set a record, with more than 3,000 people coming out, and a similarly big crowd is expected this weekend. While there was some talk of an early opening a few weeks ago, the wonky conditions and the early bookings quashed that talk. Expect riders to start lining up Friday afternoon, with the bulk of the crowd showing up very early Saturday. The Rotary Club will be serving a pancake breakfast and there will be a beer garden at the top of the gondola. The amount of terrain that will be open will depend on how much snow falls this week. What’s new at RMR this year? There’s nothing major in store for skiers and snowboarders. The terrain park was expanded and dirt was moved around to build up the jumps, so the park doesn’t just rely on snow to build the jumps. There’s also a new kids park called the Gnome Zone located to the skiers right of the terrain park. It will feature a tunnel, boxes and easy trails through the trees. The Last Spike was re-configured at the top of the Stoke to make it friendlier for beginners. There was also a focus on slope shaping and brushing to allow grooming to start earlier in the season, end later, and be easier. A new groomer was purchased, increasing the fleet to eight. New signage was installed at the bottom and top of each lift to let riders know what trails are groomed. “Particularly for people new to the resort, it should enhance their experience, the ability to know where the best skiing is and how to chase it,” said Nielsen. The Revelstoke Snowmobile Club hosts its annual opening weekend fundraiser this Friday, Dec. 2, at the Hillcrest Hotel. As usual, the club and Team Thunderstruck will be premiering the Thunderstruck 15 and will host a dinner and silent auction. The night it traditionally raises thousands of dollars for the food bank, Avalanche Canada, Search & Rescue and the club. Tickets for dinner are $35.60 including tax, and must be purchased in advance by calling the Hillcrest at 250-837-3322. Or you can just come out for the movie and auction. The big news for the club this year is the grand opening of the new greeting centre at the Boulder Mountain parking lot off Westside Road. The facility was finished in the spring and will officially open for the winter on Saturday, Dec. 3. 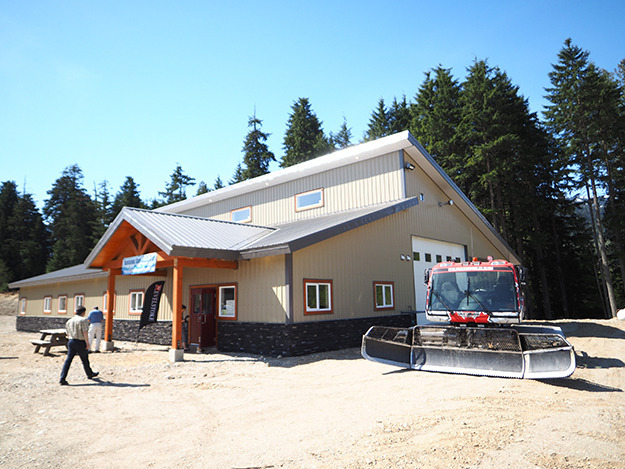 It features a ticket office, club offices, and maintenance facility for the club’s fleet of groomers. The club is hosting an open house with refreshments and snacks from 3–9 p.m. Past-presidents from the club’s 48 years have been invited to share stories of Revelstoke’s snowmobiling history. 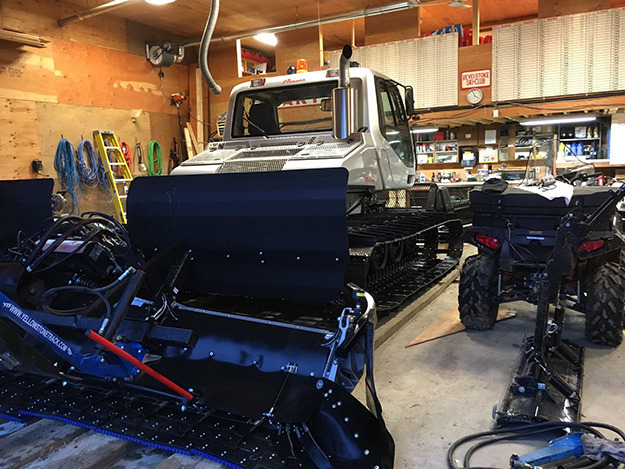 The Revelstoke Nordic Ski Club is excited for the season to start so they can take out their new groomer — a BR Pinroth 350 the club purchased thanks to funding from the Resort Municipality Infrastructure Fund, the Economic Opportunity Fund, some of its own money, and financing from the Revelstoke Credit Union. Club volunteers worked hard this fall to brush the trails, with 20 volunteers coming out for a weekend of work. As well, Downie Timber and BC Timber Sales provided machine time to help with trail and parking lot improvements. The club will be offering a full slate of lessons and coaching for everyone from three-year-olds to adults. The race team spent the summer training on and off snow, with two members – Alana Brittin and Elizabeth Elliot traveling to Sweden for two weeks. “It was an extremely exciting trip where we got to meet some really fast skiers from Sweden and were also able to have some amazing training opportunities,” said Alana.